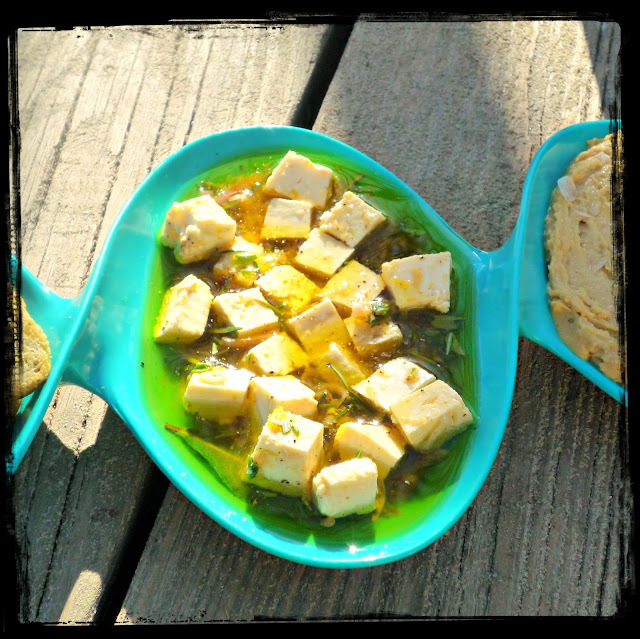 I freely admit that I love to use flavored artisan olive oils and vinegars in my cooking. They impart an extra pop of flavor that really makes a difference in the flavor of my recipes. My favorite brand of specialty olive oils and flavored vinegars are from California-based O Olive Oil. This award-winning company was the first American olive oil producer to crush organic citrus with olives to produce their line of oils. O's delicious olive oils are not infused or flavored after pressing -- as is common in the olive oil industry. Instead, their oils are created by pressing herbs and fruits with olive oils. O also has a line of flavored balsamic and other vinegars. The company recently sent me a collection of six of their most popular flavors -- three olive oils and three vinegars -- in a handy bamboo serving tray. This gift set contains Meyer Lemon, Roasted Garlic, and Basil olive oils. It also contains Fig Balsamic, White Balsamic, and Sherry vinegars. The flavors are strong without being overly assertive, and they are perfect for both cooking and finishing your recipes. 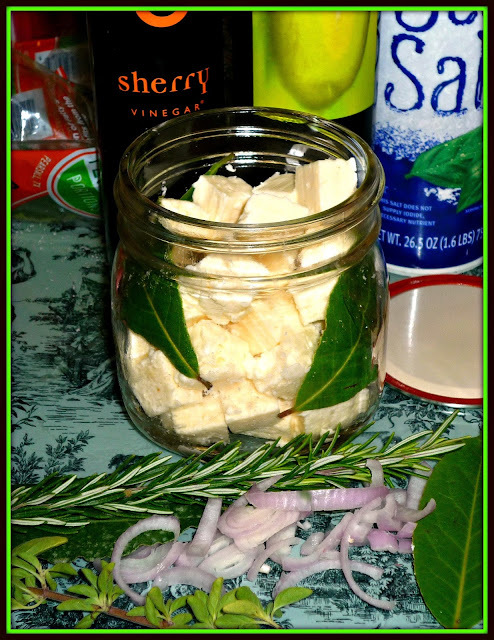 I used the Meyer Lemon olive oil and Sherry balsamic vinegar to create a flavorful and simple-to-make Zesty Marinated Feta Cheese. 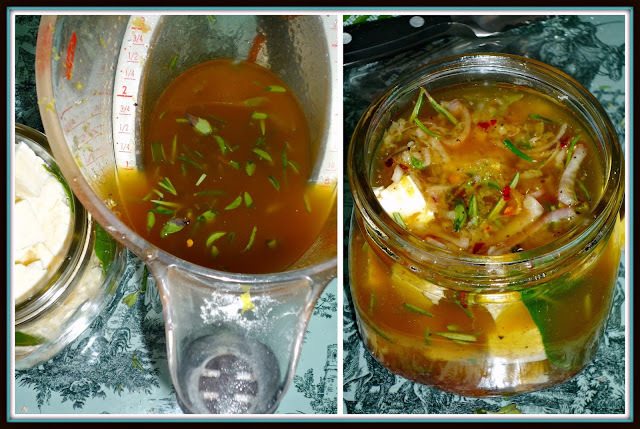 It comes together in about 15 minutes, and can be stored for 1-2 weeks in your refrigerator. This appetizer or cheese course also features fresh herbs, sliced shallot, and fresh garlic. It's perfect paired with hummus and crisp crackers for an elegant party platter -- talk about easy entertaining! Step 2: Add the O Meyer Lemon olive oil, O Sherry vinegar, lemon juice and zest, garlic, sliced shallot, oregano, rosemary, red pepper flakes, and salt & pepper to a large measuring cup. Whisk well to combine. Pour the dressing into the jar, over the feta. Step 3: Seal the glass jar and refrigerate a minimum of 2 hours before serving -- overnight is best if you have time. 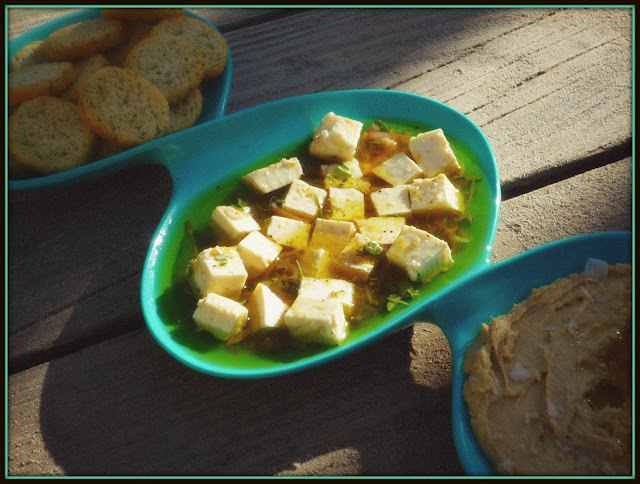 To serve, add the feta cubes to a serving platter and pour some of the flavorful dressing over the top. 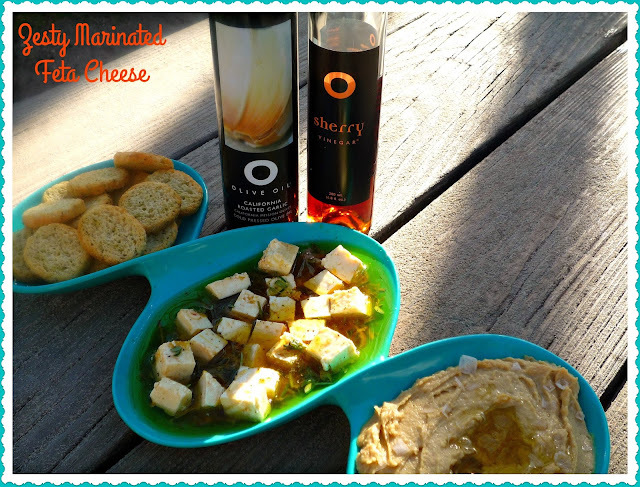 Serve with crisp crackers -- hummus is a fabulous pairing with this flavored feta. This easy make-ahead appetizers is simply delicious! The briny feta is a little spicy from the red pepper flakes, and the lemon juice and zest pairs nicely with the Meyer Lemon-infused olive oil. The Sherry vinegar provides a not-too-acidic tang, and the trio of fresh Mediterranean herbs is the perfect background flavor. This appetizer is perfect to have in your culinary bag of trips -- it's perfect for entertaining! It also makes a really fun hostess gift if you're invited to a party. How would you like to create this recipe in YOUR kitchen? 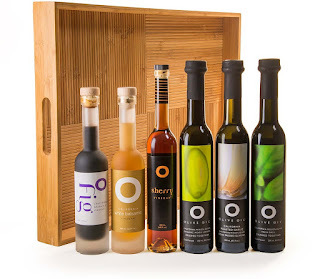 My friends at O Olive Oil are going to give one lucky reader of The Weekend Gourmet one of the six-bottle Oil & Vinegar Gift Sets that is featured in this article! This set also includes a lightweight bamboo serving tray. The retail value of this gift set is $120, and the winner must reside in the U.S. I will accept entries until 11:59 p.m. this Saturday (2/13). The winner will be notified via e-mail on Sunday. Good luck! Disclosure: O Olive Oil provided me with a six-piece Oil & Vinegar Collection to facilitate this post. All opinions stated are solely my own.